Growing up in Iowa City, Iowa, I never put much stock in ghost stories. Sure, my town had its share of legends and weird happenings, but I didn’t take it seriously until the summer of 2000, when I was sixteen. Late one night that summer, I was at the backyard bonfire with a group of my friends when we decided we wanted to go do something we’d never done before. We voted to visit the Black Angel. 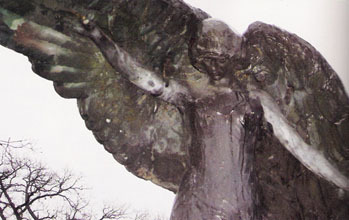 The Black Angel, located in Oakland Cemetery, is a huge statue standing over the graves of the Feldevert family. The Angel, once gleaming bronze, became covered in black patina. Supposedly, if someone crossed her path, made her angry, or did anything impure, the Angel would strike that person down. I never believed the stories, and they didn’t stop me from joining my friends as we set out 2:00 am. Four of us drove to Prairie du Chien Road and down toward Hickory Hill Park. After we parked the car and took a quarter-mile up the hill to Oakland, we climbed its south wall and began to move quietly through the huge graveyard. I’m not sure how long it took us to find the Black Angel, but she suddenly right there before us. 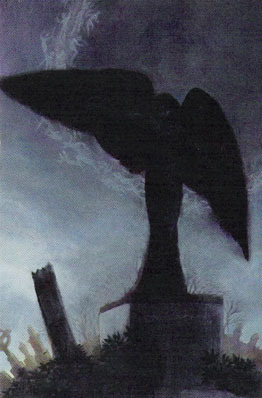 Dwarfing us all, she stood with one wing out-stretched by her hand, the other draped behind her shoulder. I remember that we stared at ther for the longest time, not knowing what to say. It’s rumored that if a virgin receives her first kiss before the angel, she’ll die; they also say that if you touch the Angel you’ll suffer a horrible ailment or even death. So, being stupid teenagers, we dared each other to touch her. Finally, one of the guys reached out a hand brushed the base of the statue with his fingertips. We then glanced up at the Angel’s face, which the moonbeams had given a hellish halo. Even scarier were her eyes: They were silver in the moonlight, and not because of the reflections from the moon. She looked positively demonic. Terrified, we ran out of the cemetery as fast as we could, scrambling up and over the wall. As we ran down the hill toward our car, we heard what sounded like loud screams coming from the cemetery. We couldn’t explain it away as the wind, since there wasn’t any wind to speak of. Relieved to make it back to the car, we quickly peeled out of the Hickory Hill parking lot. I went back to the cemetery for the first time four years later, wondering if I would witness anything to confirm what I know I saw earlier. I stood in front of the Angel and looked up into her face, but I saw nothing to be afraid of. Before leaving the cemetery, I left fresh flowers for the family of Feldeverts lying below my feet. I like to think that the Angel is just protecting them. I don’t know what it was that my friends and I saw that night, but I do know that I now keep much more of an open mind about these things. When I hear people talk about the Angel, I tell them, “It’s true. Don’t make her angry. Don’t go up there.” A few years back, some kids died after vandalizing the cemetery. Could she have had anything to do with that? If you go to the Black Angel, be respectful and understand that she’s watching over the whole cemetery.